It has been something of a surprise to me that despite the many early mornings and late evenings I have spent at lonely locations by rivers, pools and coast in England and Wales, I have never once seen an otter in these countries and yet in similar circumstances in Scotland I have seen a good number. There can be no doubt that Scotland, or at least most parts of this country, is still an otter stronghold; reports have been made of otters being observed on occasions even near the centre of major cities. Why this should be so of Scotland is open to debate, but some time ago a TV programme suggested that one of the major reasons for the lack of otters in many suitable places in England was the high mortality rate of these animals from road accidents. So many were being killed in this manner that numbers became too low to sustain a viable breeding stock in any given area. they are only present on them when crossing them or when they stray from their journey up some roadside ditch. provide suitable food items for most of the year. when dealing with these animals. he slowly made off into the centre of the pool. its natural environment, water, which enables it to make an easyescape if it wishes. This fact was brought home to me recently when I was driving along the A75, the trunk road to the ferry port of Stranraer. only a short distance from him. along the sea edge and on every evening we saw one or sometimes two otters swimming along in the sea a few yards out from the shore. They were totally unworried by the presence of either us or other people who were present on the shore. mainland opposite Skye, and from which runs a ferry over to that island. Those who know Gavin Maxwells's books will probably better know Glenelg as the village near Maxwell's home where he wrote Ring of Bright Water. On Skye itself, almost opposite the point where the ferry operates from, the Forestry Commission have built a hide; this officially is for people to use to observe the otters which are supposed to visit the area below the hide. Despite a number of evenings spent fishing into the darkness along this length of coast, we never saw any sign of otters; a consolation was the numerous seal sightings we made. Otters don't appear to order, unfortunately. circumstances on a number of occasions. numbers of small coalfish after dark. The jetty provided great fishing for these coalfish on one September holiday in the area. into the darkness on his journey. When we moved to S.W. Scotland we looked forward to seeing at least a few otters, but in fact nearly two years went by without any sighting of them, until on a June evening, whilst fishing from a quiet beach just as it was going dark, an otter ran along the beach in front of us and was gone into the sea. I fished there up to darkness, the otter would leave its island retreat about half an hour before darkness, looking for food. about a yard from the bank. He must have 'smelt' the carp, as he went mad and churned the water up trying to find it (the carp had fled out into the weed). Having failed the find the fish, he popped his head up out of the water, saw me, and took off for the safety of his island. On another pool nearby which I fish, especially in winter, otters often visit, particularly when the rivers are in flood; again they usually come out about a half hour before dark, but sometimes if all is quiet they will come out during the day to look for food and ruin my fishing. In fact, whilst otters are usually considered to be animals that prefer their own company, I have on a number of occasions seen two adults together, fishing or playing. 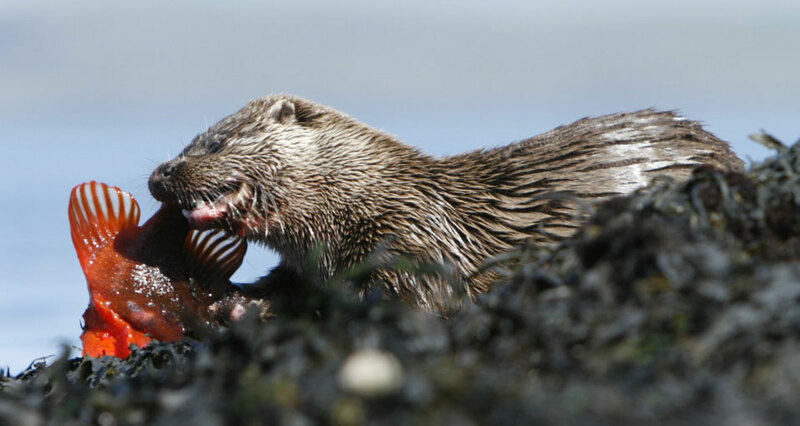 Otter eating a Lumpsucker, Cyclopterus lumpus, on the Isle of Mull. kill them. Unfortunately it is very difficult to obtain concrete evidence of their killing. I hope that if you are visiting Scotland and have never seen an otter I may have given some pointers to when and where to look.